Today’s Guest Post is looking at the value of photographs in the world of fine art. It’s an interesting piece – what could your photos be worth? When the great modernists of the twentieth century ruptured the old orthodoxy of the ancient world, so restrained, traditional and parochial, they were met with confusion, insult and derision. The establishment and the general public didn’t understand it, nor did they want to. However, soon enough, this artistic schism, which at first felt like the vilification of everything that had existed, came to be accepted, at first reluctantly and later with the warmest embrace. The great liberators had offered another way of understanding and engaging with life. In much the same way, photography in the context of fine art was an idea that was not received well. While accepted as landmark breakthrough – to capture a physical moment that can never be experienced again is still to this day rather impressive – it was felt as though it could never be part of the history of art. “At an early meeting of the Photographic Society of London, established in 1853, one of the members complained that the new technique was ‘too literal to compete with works of art”‘ because it was unable to ‘elevate the imagination,'” highlighted the journalist Michael Prodger for the Guardian last year. Today though, beyond postmodernism, photography has become a popular medium to disseminate their ideas. Others though, principally photographers, are challenging what a picture is, leaving it up to the rest of us to give it some form of identity. Here’s a fitting example. 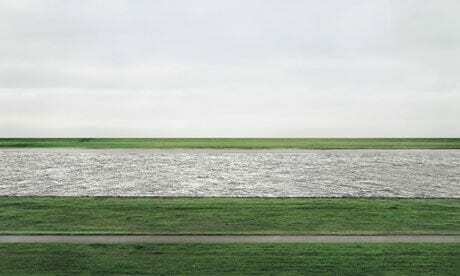 Two years ago, the visual artist Andreas Gursky’s Rhein II sold for $4.3 million (approximately £2.7 million) at a Christie’s auction in New York. It was a new record for a photograph, one which is of an empty, nondescript landscape. “It says a lot using the most minimal means,” he once said in an interview.” For me it is an allegorical picture about the meaning of life and how things are.”Artistically and financially, this showed the possibility of how positively a photograph can be received as art. However, it can be no rudimentary, half-concocted effort. Though you can certainly take Marcel Duchamp’s ready-made philosophy and apply it to this, a seminal work has a quality that is “true” and therefore becomes much more than its component part. That truthful feature, whatever that may be, does not necessarily equate to the amount of effort that is invested in devising the piece – it only took Pablo Picasso one afternoon to execute his masterpiece Le Reve – but requires a “mystery”. The best way to figure it out is to invest in a photograph, be it a determined work of art – an artist has made it – or an image taken in a literal sense – a monochrome print by Henri Cartier-Bresson – and make sense of it yourself. If you say it is art, then, in accordance with the way you see the world, it is certainly anything you want it to be. If you’re obtaining the picture from a gallery, be sure to hire specialists, a company that can deliver fine art removal services. You might not have figured out fully whether the photograph can be deemed art – specifically by you – but the cost of it nevertheless suggests it is a valuable object.